If you die without a Will your property will be distributed to your heirs according to formulas as determined by the Virginia Statutes. That is, the State, not you, controls who gets what. State formulas for determining asset distribution are rigid and make no exceptions for family members in need or what anyone claims you might or might not have wanted. The State also appoints the person to manage your estate. This person could be someone you never would have wanted to handle this important matter. Finally, the cost of probating your estate may be significantly higher than if you had created a valid Will. Do you need a lawyer to create a Will for you? 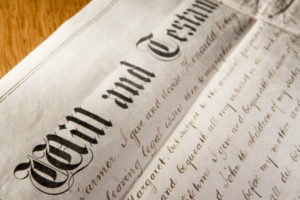 You can create a Will without a lawyer, and there are various on-line services and software programs to help you do it. However, this can lead to numerous, and financially catastrophic, problems. A lawyer with experience in this area has the judgment and knowledge necessary to avoid the innumerable pitfalls and advise the course best suited for each individual situation. Every family is unique, with very specific dynamics, concerns and goals. A lawyer can take these into account and design a customized Will capable of meeting your goals and anticipating potential problems down the road, such as challenges to the Will, family disagreements, improperly written and therefore invalid Wills, and more. You should know that many estate planning attorneys actually earn more revenue “fixing” Wills created by individuals or generic, one-size-fits-all services than they do creating Wills themselves. It can be cheaper, and safer, to have an attorney design and implement your Will. It is also important to have an attorney review your Will at least every three years, to make sure it is still valid and meets your needs.